It all started when Bob Boston got a part time job selling MGs and Austin Healeys in 1967 while he was attending Ohio State Univ. Bob had grown up around his father’s car dealership and had experienced every kind of car. Since he was 16 he had had several Studebaker Loewy coupes, 51 Mercury convertible, and a 56 Ford sunliner convertible, silver metal flake with continental kit, flipper hubcaps and a fur covered dash (ex carnies car). He had even driven for a couple weeks such cars from the car lot as 1957 Alfa Romeo spyder, Mercedes 190 SL, 1958 Jaguar XK150 DHC. But everything changed when he and his girlfriend (now wife) Judy, decided to trade in his black 1963 Dodge Polara 500 convertible on a 1960 MGA roadster. He was hooked. After Bob and Judy got married , Bob spent a year working in a stock brokerage firm but hated every minute of it. They decided he would quit and buy and sell sports cars. He started buying unloved imports from his fathers used car dealer buddies, cleaning them up and reselling them in the local Sunday newspaper. The summer of 1969 made him a $9400 profit from only a $1000 start up fund. Wow!, this was easy….let’s try something harder. So they bought a Mustang convertible, a Firebird and a Corvette and took them to Baltimore to ship them to England. (Bob had seen a magazine showing high used car prices in England but was too dumb to know that part of the reason these prices were so high was the almost 70% import duty England levied on such imports).When he later arrived at port of Southampton England to collect his 3 cars, Bob could only scrape up enough money to get the Corvette through customs. He immediately put it in the London Sunday Times and sold it for Pounds Cash. Went back to port, got the other 2 cars out of hock and sold them the same way. Now he had all this British cash which he took to London bank and was shocked to find out that Britain was at that time, a closed economy and he could not wire these funds back to the US. “Big time car mogul”?....NOT ..So Bob realized the only way he could get his money back to US was to buy old cars in UK and ship them back home. So he picked up the British Exchange and Mart paper and proceeded to go all over England and purchase 11 old MG TD, TC and Morgan cars with the money he had gotten out of his 3 American cars. Thus starting an import business to US of older British classics. No more shipping American cars to England, just take money and buy Brit cars….which he did… over 200 of them over the next couple years. Mostly Morgans and MGs with a spattering of other Brit oddities. Then, as with or addictions, Bob wanted something more…He met Leonzio Bruni. Leo had come to England in his Maserati Mistral to buy an old flat radiator Morgan to take back to Italy. He had gone into a dealers showroom to ask about a Morgan. It just so happened this dealer was friends with Bob and he told Leo that he had a “Yank” friend who knew all about Morgans. We met and I found Leo the Morgan he wanted and and bought his Maserati. He then took me back to Italy where my eyes were opened to the Exotic world of Italian cars and the unbelievable realities of trying to make sense of the way Italians do business (using the word loosely). With Leo’s help and despite Leo’s help, Bob bought a lot of used cars. Ferrari, Dino, Maserati, Lamborghini, Iso Grifo, Lancia, Bizzarrini were all names of these pulse pounding pieces of Italian art. And when I say art, I mean it in the sense that most art is pretty much non-functional in any practical way, much like these Italian cars were. During these years, the US EPA and DOT was getting much more strict on what could be imported, so to circumvent the EPA, Bob and Leo had these cars converted to run on propane gas (LPG), which, at the time, the EPA had no jurisdiction over. Of course this eventually led to problems with customs and car seizures, legal fees, EPA battles, grief of every sort. All the things that make the life of an “Exotic Car Importer” the stuff of dreams. Wow, the only good thing in all this was that Bobs loyal wife Judy, stayed. So Judy and Bob and their 6 year old son, moved in the spring of 1975 from Ohio (home of deep seated “farmer conservatism”), to Atlanta Georgia, where money flowed and nice cars were everywhere. Bob went to work at Baker Motor Company, 3002 Peachtree road. 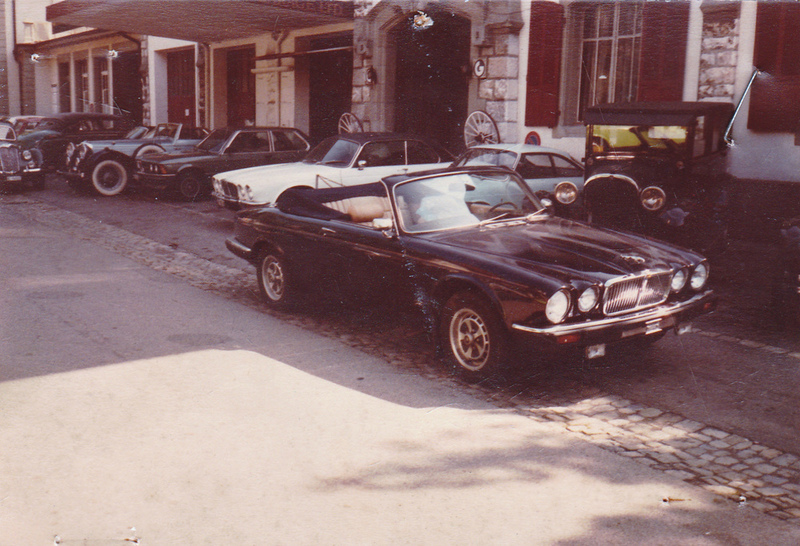 Baker was authorized dealer for Jaguar, Ferrari, MG, Triumph, FIAT, Alfa Romeo, Jensen. This was like heaven….Bob immersed himself in the cars and selling and when Baker sold out in 1977, he opened his own Sports Car Store, in Roswell, the Atlanta area suburb he lived in. In 1978-79 the US Dollar was weak, so while selling hundreds of used MGs, FIATs, TRs and the like from the Sports Car Store, Bob started exporting used Austin Healey 3000s back to Europe. Most went to Switzerland to Oldtimer Garage in Bern. During 81,82 we also were US importers for the Caterham super 7 and the Marcos (both in component form and in small numbers). In 1981, while in Bern, Bob had lunch with some car dealers. In this group was an employee of the US consulate who told them about a new US regulation getting ready to take effect. This regulation was from the EPA and it gave a one time exemption from US pollution requirement for any US citizen importing a car that was at least 5 years old. Wow, what a loophole…The US dollar was very strong by 1981 so European cars were a “deal” when bought in dollars. Questions, questions…Could this new exemption be true? Could your right to import one car EPA exempt be sold to someone else? Over the next months we tried to find out some answers but US customs really didn’t know anything about it. So we gave it a go. Bob bought a couple used Mercedes 450 SLs that were 5 years old and imported them in the names of a couple of Bobs employees that had never imported a car before. When they arrived in Jacksonville, we cleared customs, posted bond to guarantee EPA and DOT modification would be made, and waited. Sure enough, the EPA sent exemption letters on each car. We then made DOT modifications to lights, bumpers, side door beams and sent in compliance packet to get their release. Bob then set out with a dealer friend from Luxembourg to create a company called “Euro-Car”. Plus a plan to buy 5 year old German cars (Mercedes, BMW, Porsche) then import them to the US in names of individuals who Bob had paid for their rights to this EPA exemption. We imported bunches of cars like this, mostly to Jacksonville. Judy handled the unbelievable task of putting together the 300+ page documentation packet on each car imported for DOT release. But a year or so later when a group of 16 used Mercedes 450 SLs were shipped to Norfolk, US customs seized the cars, saying, ”you cannot buy someones option to import a car and get this EPA exemption”. Legal wranglings ensued, lawyers were paid. In the end, US customs kept 9 of the Mercedes that they chose. They were given to customs employees who had long term seniority. I got back 7 of the worst ones, a big fine, one count of false statements to customs and another big life lesson. From then on, we warehoused the used cars we had for sale in Luxembourg and actually pre sold them to US customers who we helped import them in their names. We then would do the DOT modifications and Judy would send in the compliance packets. All very complicated but it allowed Euro-Car to import hundreds of cars until 1985 when we decided it was time to quit. Within 90 days of Euro-Car selling off the remaining stock of cars we had in Luxembourg, the whole thing was over. The EPA exemption was gone. So many people had tried to import cars, the EPA shut it down. What next? During the time Bob and Judy were importing German cars, Judy was driving a Jaguar XJ6 while Bob drove a Citroen CX turbo. Maybe the US buying public was ready for the Citroen CX? So he proceeded to buy a couple used Citroen CXs in Germany to crash test in the US for legal certification. This was Bob’s first foray into the world of US EPA and DOT certification though the front door. During the next year and a half while doing 5 different crash tests and submitting reams of documentation and engineering reports, the US dollar was falling in value. This took our target MSRP on these new 1985-86 Citroens from about $23,000 to nearly $33,000. We eventually got full EPA and DOT certification but the 117 Citroen CXs we imported were hard to sell for these prices. People in the US just didn’t know this car. After selling off the last of the CXs it was a wash. With all the crash testing costs and such, it had pretty well used what money we had made during Grey market German car importing. With another weak dollar time, Bob decided to go back to his basics…what he knew best…British cars, so in 1987 he changed company names to, Driver’s Seat Investments. Bob then used his network of customers and friends around the US to help him find and buy, used Jaguars primarily, but also big Healeys, MGAs, TRs. We then ran large display ads in German and British car magazines. “Buy Direst from America…Cut out the middleman”. When these older British sports cars were sold new, about 80% of them came to the USA. So we had a lot more used ones here than in Europe and our prices were cheaper. From 1987-1990, Driver’s Seat Investments sold and loaded containers for export until over 700 cars had been sold for export. Also during this time we got our first taste of manufacturing when we designed and built in our shop a complete steel kit to convert Jaguar XKE 2+2 coupes into convertibles. This kit which contained all components needed (glass, chrome, body panels, convertible top bows and upholstery) was sold all over the world. In 1990 when the car export business died due to raising European interest rates, we continued manufacturing these convertible conversion kits for the XKE. Then later we made a kit for 1965-68 Mustang coupes to convertible and also in house did Mercedes 111 convertible conversions to coupes. While continuing to do convertible conversions in a small shop during most of the 1990s we couldn’t really see any good import/export possibilities, so when Bob’s old friend from Baker Motors company days in 1975, who was now general manager of the largest Mercedes dealership in Atlanta, asked Bob to come work with him to launch the new Mercedes ML SUV to the public, he jumped at the chance. So in the Spring of 1997 Bob put on a neck tie and for the next 2 years sold and delivered more ML320s than anybody in the Southeast region. Even while selling new Mercedes, Bob and Judy still drove Jaguars. They just felt right. Then in the spring of 1999 a fantastic opportunity opened up. A former employee of Bob’s had a medical supply business and with it came a handicap van shop where vans were modified for wheelchair users. The van division had been losing money so Bob was hired to get it back to a profitable state so it could be sold. When Bob saw the lowered floor minivans that this company was a dealer for, he thought he could build a better one for a lot less money…..so he bought the company, Adaptive Mobility Systems and built his own version of the Dodge Grand Caravan with lowered floor and power wheelchair ramp. They then had this crash tested and fully certified with DOT. Production started and today, Adaptive is the largest private label handicapped van maker in the US. The day to day running of the van production is pretty much handled by Bob & Judy’s 2 younger sons so Bob has the time and facilities to be a serious British car collector. About 2006 he met Donald Lower, a Brit who had been in the US since 1980 and who had extensive Jaguar, Rolls Royce history. Bob convinced Donald to leave hurricane ridden Florida and come up to Atlanta and they would build some “interesting vehicles” together. And, as they say, “the rest is history”.